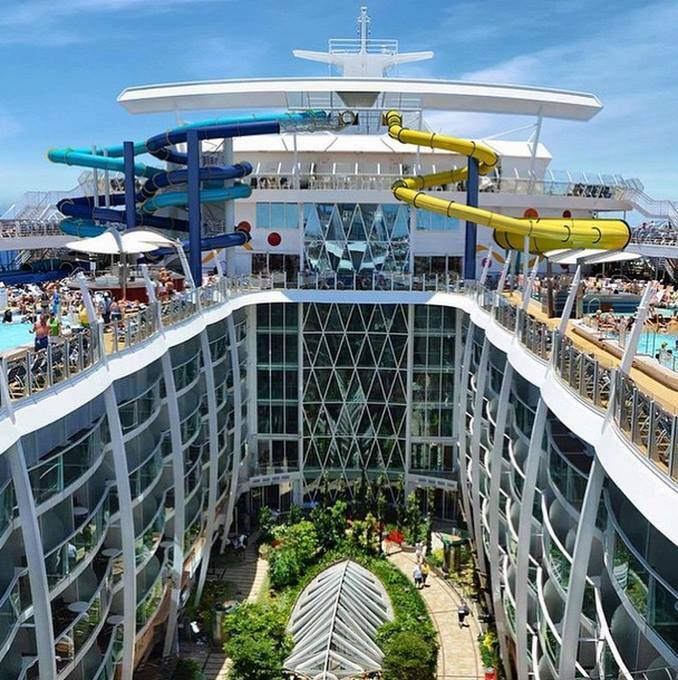 After weeks of speculation, Royal Caribbean announced it will name its third Oasis-class ship Harmony of the Seas. 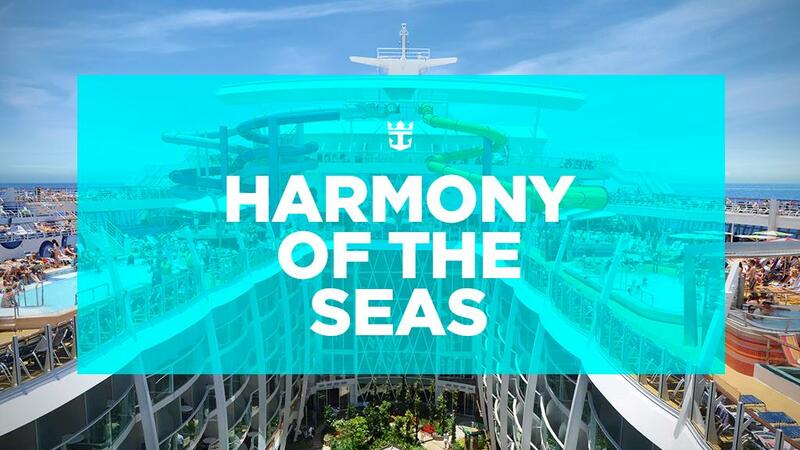 Drum roll please...Royal Caribbean's newest ship to be named #HarmonyoftheSeas. More details to follow soon! Rumors of the ship's name had been circulating around the internet for a while now but Royal Caribbean chose to hold back the ship's official name until now. UPDATE: Thanks to an intrepid blog reader, we have a better look at the rendering for Harmony of the Seas, which reveals multiple water slides, which would be a first for the Oasis-class and a fairly unique addition to any Royal Caribbean ship. Despite the fact we now know the name, little else is known about Harmony of the Seas. Harmony has been in the shadow of Quantum of the Seas and Anthem of the Seas but guests can expect more information to start coming out more frequently in the months leading up to her debut. Harmony of the Seas is under construction at the STX shipyard in St. Nazaire, France and is scheduled to debut in April 2016. Royal Caribbean's third Oasis-class cruise ship has quietly been under construction at the STX shipyard in St. Nazaire, France for a little while now and today we have some new photos of her progress. Royal Caribbean took some official shots of this new ship, wich is shceduled to debut in April 2016. We still do not know her name or where she will be homeported, but this is a good indication of her progress. Royal Caribbean has awarded L-3 Marine Systems International the contract to provide its NACOS Platinum navigation system for the third Oasis-class ship that is being build by STX France. The navigation equipment for the new vessel includes L-3 SAM Electronics’ NACOS Platinum navigation system, comprising five X- and S-band radars linked to 9 Multipilot workstations for the combined display of ARPA radar, ECDIS and conning functions. L-3’s NACOS Platinum series will also include an advanced dynamic positioning system, developed by L-3 Dynamic Positioning & Control Systems, and features four multifunction touch screen consoles, one CP1 DP controller, and interfaces for required environmental and position reference sensors. Positioning software, specifically developed for critical cruise ship station-keeping operations, is designed to significantly reduce fuel consumption and exhaust emissions. 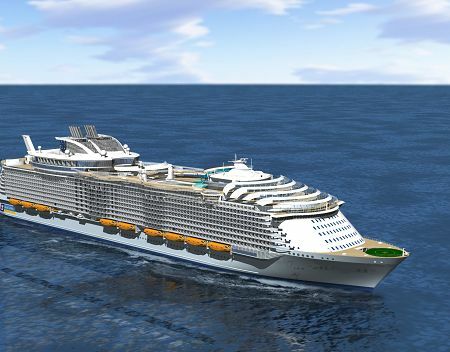 The third unnamed Oasis-class ship is scheduled for delivery to Royal Caribbean in spring 2016. Royal Caribbean layed the keel for it third Oasis-class cruise ship by placing a 1,000 ton block into position. In addition to keel-laying, the coin ceremony was held at STX France shipyard. 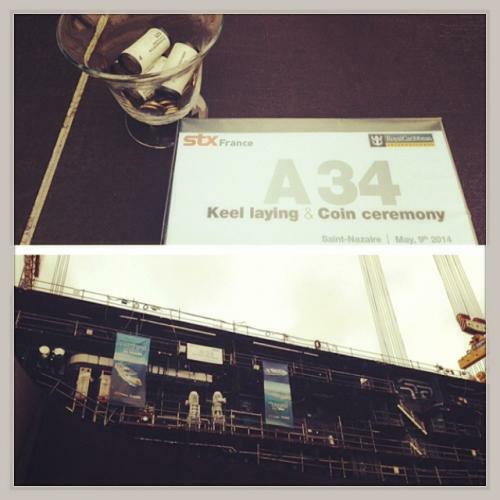 The keel-laying marks the official beginning of a ship's construction. 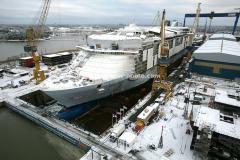 The third Oasis-class ship is scheduled to be completed in 2016. Also during the ceremony, Royal Caribbean chairman Richard Fain announced the company would build a fourth Oasis-class cruise ship that will be ready by 2018. 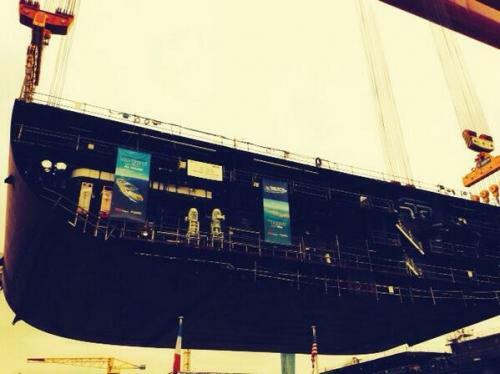 We have our first images of Royal Caribbean's third Oasis class ship, which is being built at STX Europe. The images are 3D renders and since they are the sister ships Oasis of the Seas and Allure of the Seas, look identical to those ships. Royal Caribbean has confirmed the ship's order of construction back in December 2012 but no other details about the ship exist, including a name. The third in the Oasis class will be ready for delivery to Royal Caribbean in mid-2016. Royal Caribbean has released a video showing off the beginning of construction of its third Oasis-class cruise ship. When complete, it will be the largest cruise ship in the world. The new ship will be complete in 2016. Royal Caribbean's next three cruise ships, Quantum of the Seas, Anthem of the Seas and a yet-to-be-named third Oasis class ship, will utilize processing technology supplier Metso DNA for its integrated alarm, monitoring and control systems. Metso is being contracted by the Meyer Werft shipyard in Germany, where the ships are being constructed. Each ship will recieve integrated alarm, monitoring and control systems that are capable of producing 18,000 input/outputs in the machinery, air conditioning and emergency shutdown systems. The diesel electric power plant will also be managed by the system. Previously Metso had provided the automation system components for Royal Caribbean's Radiance class of ships. STX France is making preperations to begin construction on Royal Caribbean's third Oasis-class cruise ship by first building a frame to help build the massive ship. In order to accomodate the massive ship, STX France is constructing a new portico, which started arriving this week. Formal construction on the portico will begin starting next month. Once the portico is complete, STX France expects the shipyard to begin construction of the new Oasis-class ship in the first quarter of 2014. The new STX France portico, ordered specifically for the new Oasis class ship but will be used for other future builds, just arrived in Saint-Nazaire from China in the last few days. It weighs 160 tonnes and measures 44 by 10 meters. The old portico was built in 1968 and was one of the oldest in the world. Royal Caribbean's third Oasis-class ship will be built at STX France shipyard and today ArcelorMittal has been selected to provide 100% of the steel for the hull and 20 bridges in the new ship. The agreement will supply more than 40,000 tonnes of plates and coils from ArcelorMittal's European sites. The coils will be produced at Fos-sur-Mer, France and will then be processed into sheets by ArcelorMittal's St Nazaire Distribution Solutions unit. 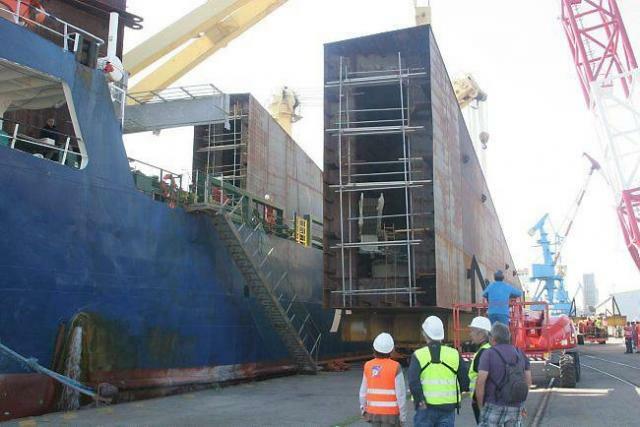 Afterwards, the coils will then be delivered to STX France. The plates are being produced by ArcelorMittal Gijon, Spain and shipped to STX France. Deliveries will commence in September 2013, when construction of the hull will begin. Hervé Bourrier, CEO, ArcelorMittal France said: "This contract demonstrates our ability to deliver high quality steels and tailored services from our European industrial and sales units, and confirms our long-term presence as a steel supplier to the cruise ship market, one that has seen consistent growth over the last five years." 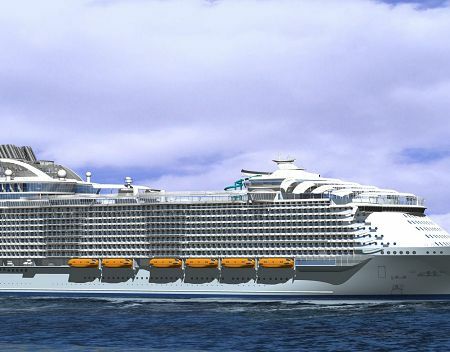 The ship, which will have around 2,700 cabins, will be delivered in 2016 to Royal Caribbean.